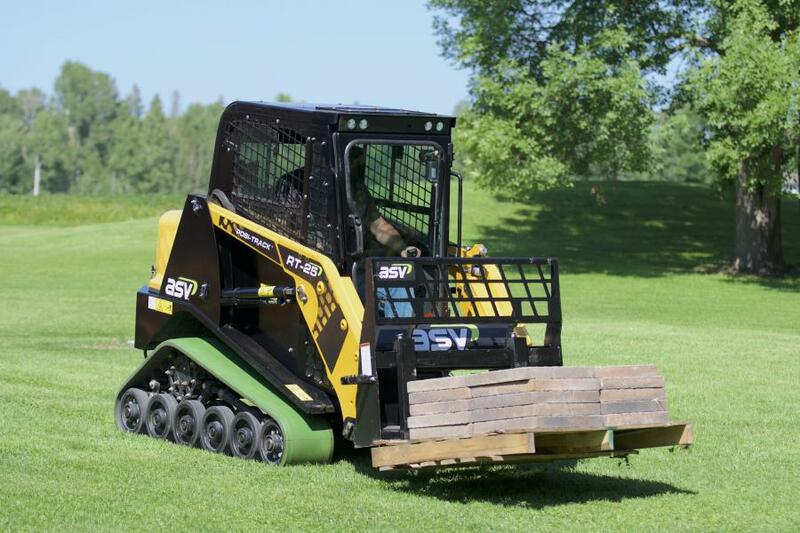 ASV Holdings Inc., an industry-leading manufacturer of all-purpose and all-season compact track loaders and skid steers, introduced the new RT-25 Posi-Track compact track loader. Featuring similar dimensions as its more powerful cousin, the RT-40, the RT-25 serves as an economical alternative for contractors, rental centers and homeowners working in tight spaces. Its size makes the loader the industry's smallest sit-in CTL. The RT-25 also is a safer, more productive alternative to walk-behind and stand-on mini loaders in applications such as landscaping, construction and snow removal, according to the manufacturer. ASV introduced the RT-25 at 2018 GIE+EXPO in Louisville, Ky.
"Despite its small size, the RT-25 is no toy. It includes many of the features that define ASV CTLs and make them productivity-boosting powerhouses, all in an incredibly compact package," said Justin Rupar, ASV Holdings Inc. vice president of sales and marketing. "We made the machine economical so small- to mid-sized contractors and rental centers can take advantage of its versatility, lightweight qualities and the ability to get otherwise difficult jobs done quickly." The RT-25 measures just 48 in. (122 cm) wide, making it easy to drive through tight spaces while minimizing the risk of property or machine damage. This includes landscaping or construction in high-density housing or confined areas where structures such as fences may otherwise need to be removed to accommodate larger equipment. The unit's 3,755-lb. (1,703 kg) operating weight further reduces risks of damage to turf or sensitive surfaces. That low weight also contributes to increased flotation and traction for snow clearing on sidewalks, driveways or in alleyways. A completely smooth turf track also is available to minimize the risk of damage to manicured lawns and golf course greens. The RT-25's compact size makes it an optimal addition to rental fleets. Because of its low weight, drivers can transport the CTL on a trailer pulled by a 1/2-ton pick-up truck or SUV. Due to the machine's straightforward controls, learning how to use the unit is fast and simple. Filters and other daily serviceability checkpoints are within easy reach due to a large hood opening that gives access to all sides of the engine. This means speedier rental turnarounds and less downtime for contractors, according to the manufacturer. The RT-25's small size also makes it a safer and more productive alternative to stand-on or walk-behind loaders. The unit's cab shields the operator from outside elements and provides rollover protection, something uncommon with walk-behind and stand-on units which are prone to accidental tipping. The RT-25 also features an optional heated cab for additional comfort during winter operation. The machine's industrial 25-hp Perkins diesel engine and 5.1 mph top speed allow operators to achieve maximum productivity by moving around quickly and digging and lifting more. The engine is turbocharged so it can output its full horsepower even at high elevations. The Tier IV Final engine requires no regeneration, exhaust sensors or diesel exhaust fluid. The RT-25 features a rated operating capacity of 665 lbs. (301.6 kg), a tipping load of 1,900 lbs. (861.8 kg) and an 8.4-ft. (2.5 m) lift height. ASV builds the machine with the same drive motor as the RT-40, allowing it to achieve the same high tractive effort, which gives it enhanced pushing and digging power. The RT-25's quick-attach suits a variety of available attachments. 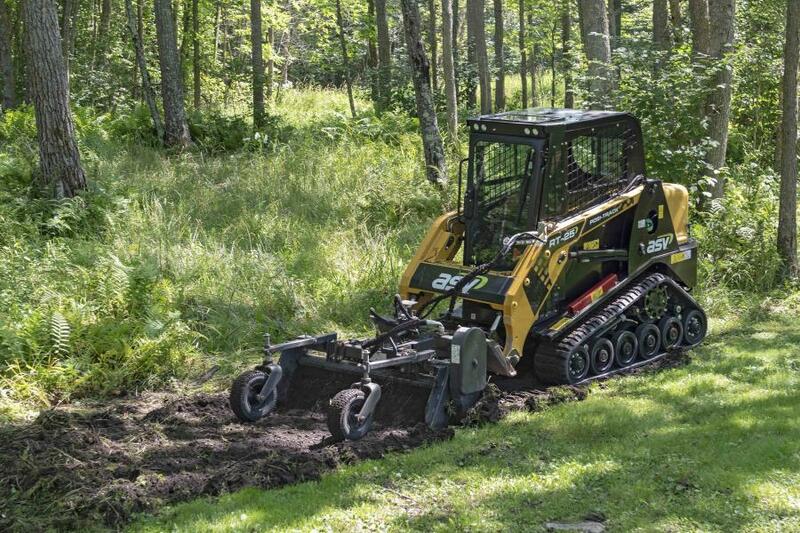 Variable auxiliary hydraulic flow comes standard on the Posi-Track loader. The system operates efficiently and at a high auxiliary circuit flow rate with an 11.3-gpm pump capacity and 3,000 psi system pressure. As with all of their models, ASV equips the RT-25 with direct drive pumps. The direct drive system eliminates labor-intensive belt servicing required with belt-driven pumps. The direct drive pumps along with the machine's large line sizes and hydraulic coolers transfer more flow and pressure directly to the attachment and prevent power loss, making for a highly productive machine despite its small engine size. ASV manufactures its loaders with its Posi-Track undercarriage. The system allows customers to use the RT-25 efficiently all year long due to its maximum control, flotation, traction and pushing power in steep, wet, muddy and slippery conditions. The Posi-Track loader system features a flexible rubber track with internal positive drive sprockets to provide superior traction and track life. The open-rail and drive-sprocket design, rather than the traditional enclosed tub system, results in increased sprocket and bogie life along with easier and faster undercarriage cleaning. All of the wheels are exposed in the undercarriage, allowing material to spill out, reducing the risk of abrasive material getting trapped and wearing away at components. In addition, Posi-Track loaders feature as many as four times more ground contact points in their tracks than other steel embedded models. This spreads the unit's weight evenly, resulting in lower psi and extra flotation on delicate surfaces. The result for the RT-25, which contains 12 contact points per track, is an industry-low ground pressure of 3.1 psi. The RT-25's large number of contact points and guide lugs also virtually eliminate the risk of track derailment, according to the manufacturer. ASV designs its Posi-Track and skid-steer loader frames separately to provide customers with the highest performance from each machine. The result of the dedicated frame for the RT-25 is a 10-in. (25.4 cm) ground clearance that allows the unit to easily travel over logs, stumps, rocks and other obstructions with less risk of getting hung up. The purpose-built chassis also provides a 55-degree departure angle for effective uphill travel. For more information, call 800/205-9913 or visit www.asvi.com.